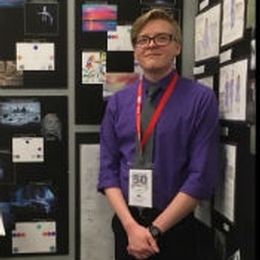 Student Jacob Rodgers (pictured) competed with 96 entries for Regional Design Projects and was the single winner for his lighting design of Eurydice. He was also the single winner of the Stagecraft Institute of Las Vegas Award which includes a one week master class. Other design and technology honors went to Sarah Parrott for sound design of last fall’s production of Radio Plays. Of 244 performance entries, two Sinclair students advanced to the semi-finals and Bryana Bentley was one of 16 finalists. Faculty member Kimberly Borst received a Certificate of Merit as director of the recent production of Blues for an Alabama Sky. Colleges and universities from a six-state region participated in the festival, and Sinclair was the only 2-year college to have students advance. Bravo!